GPS is a very handy tool, making sightseeing easier and brilliant for those who work away a lot or people who travel regularly. Mediatek-powered devices can struggle with this feature but the service can be improved by tweaking the setting on your phone. If you have one of the following running your device this tutorial can help you get the most out of your phone’s GPS: MTK6592, MTK6582, MTK6589, MTK 6577 and MTK6575. Before you start you need to make sure you have a ROOTED Android phone, uninterrupted internet connection and the GPS Test Application (available from Play Store). Once you’ve got what you need and you’re ready to get started, these are the steps to a better GPS. 2. 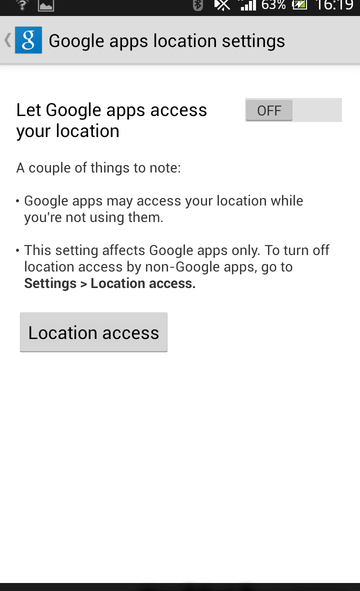 Next go to ‘Settings’ then tap on ‘Google’ then select ‘Location Settings’ and make sure ‘Let Google apps access your location’ is set to ‘ON’. 3. Choose the option of ‘Location Access’. Make sure that All the options available there are Checked “ON”. as you can see in the image: You can also do get to the same stage by choosing ‘Settings’ and then ‘Location Access’ if you prefer. 4. 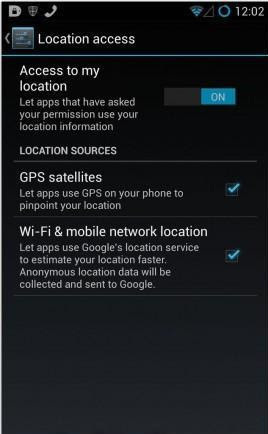 Next, in ‘Settings’ go to ‘Location Access’, and open ‘GPS satellites’. 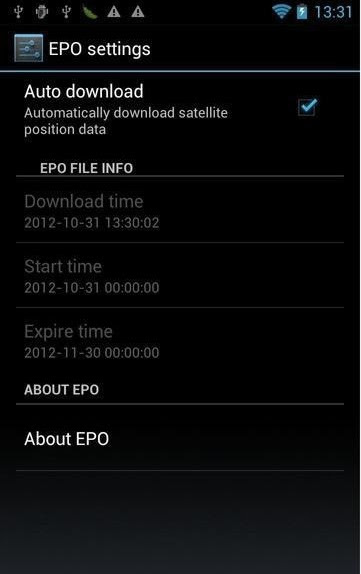 Then you can enable ‘GPS EPO assistance’ as shown in the picture below. 5. Next go to ‘EPO settings’, which looks like this and set the EPO data to download. 6. Now Enable AGPS GPS. 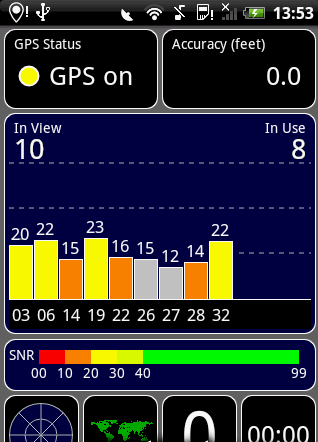 This should mean you have GPS enabled on your MTK device. To check all is well, however, you can test the feature. To do this you need to Install ‘GPS Test’ from the link in the initial instructions at the beginning of the article. 7. 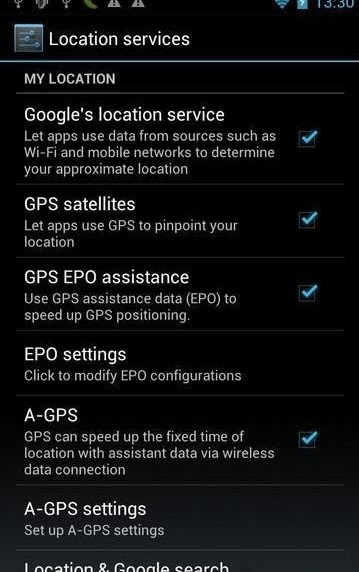 If you have it, in the GPS Test App, tap Menu/Settings and check screen always on. But if this doesn’t work then try going out and moving around, if these graphs start to move, all is well and you’re good to go. After you’ve completed these steps you should have a capable GPS system and be confident enough to actually rely on it. Inspired by their everlasting passion for performance, Huawei has introduced the world to their latest premium phone – the Huawei Mate 9 Porsche. Featuring a sleek and stylish Porsche design, this full-black smartphone certainly is a feast to the eye. The Porsche design Huawei Mate 9 comes packed with state-of-the art technology – allowing it to bring forth an extremely powerful and ultra-fast performance just as a Porsche car itself. With its high-end specs and stunning desigh, this Android phone truly is a luxury high-performance device that is fits the style of anybody that likes to push life to the limit. With its Octa-Core CPU that has been clocked at 2.4GHz along with 4GB of RAM, an exceptionally fast and powerful performance will be delivered any time you turn on this Android device. Whether you like to enjoy demanding games, Full-HD movies, the latest mobile Apps, or simply like to browse the web – this premium phone is sure to meet all your demands. Additionally, it brings along great multitasking possibilities, allowing you to enjoy numerous of its high-end features at the same time without ever slowing down your Android 7.0 smartphone. With a stunning 254GB of internal storage and a second 254GB external storage option, you will have access to an unlimited pool or memory – guarantying that there always will be enough space for you to safe your latest files and media alike. Packed within its premium body lays a mesmerizing 5.5-Inch AMOLED display that portraits all your favorite media in a whopping 2560×1440 (WQHD) resolution. On the rear of this stunning Android phone you’ll furthermore be able to find a mind blowing 20MP dual-camera with which you’ll be able to shoot breathtaking photographs and ultra-HD video at any given moment. No matter where you’ll be heading next, with this Android phone at your side, you’ll have all the means necessary to snap the perfect pictures of all those special upcoming moments in life. Leave comments box of color before check out. Samsung W2017 smartphone was launched in November 2016. The phone comes with a 4.20-inch touchscreen display with a resolution of 1080 pixels by 1920 pixels. The Samsung W2017 is powered by 1.6GHz quad-core QualcommSnapdragon 835 processor and it comes with 4GB of RAM. The phone packs 64GB of internal storage that can be expanded up to 256GB via a microSD card. As far as the cameras are concerned, the Samsung W2017 packs a 12-megapixel primary camera on the rear and a 5-megapixel front shooter for selfies. The Samsung W2017 runs Android 7.1 and is powered by a 2300mAh non removable battery. It measures 127.80 x 61.40 x 15.80 (height x width x thickness) and weighs 208.00 grams. The Samsung W2017 is a dual SIM (GSM + CDMA and GSM + CDMA) smartphone that accepts Micro-SIM and Micro-SIM. Connectivity options include Wi-Fi, GPS, Bluetooth, USB OTG, 3G and 4G. Sensors on the phone include Proximity sensor, Accelerometer, Ambient light sensor, Gyroscope and Barometer. This Xiaomi Mi Mix is an amazingly gorgeous phone, and that is in large part to its spectacular bezel-less 6.4 inch display that boasts an impressive 2048×1080 resolution. With a 91.3% body to screen ratio the only thing you see when you look at the front of this phone is the display, which certainly takes center stage. In fact when holding the phone in your hand the display totally fills up the front of the phone and makes it feel like you’re just holding the display in your hand. This puts the Mi Mix is the upper echelons of smartphones when it comes to design and attractiveness and is certainly the future of Smartphone design. Packing a 4000mAh battery will ensure plenty of usage time and means you can go for longer between recharges which can be taken care of through the USB type C port on the base of the phone. The Xiaomi Max Mix smartphone comes with 12 months warranty, brought to you by the leader in electronic devices as well as wholesale Android phones..
Samsung Galaxy S8 Clone is the bezel-less Smartphone that has it all. This latest offering from Chinese Smartphone giant Xiaomi is taking the world by storm. This Samsung Galaxy S8 Clone is an amazingly gorgeous phone, and that is in large part to its spectacular bezel-less 5.7 Inch display that boasts an impressive 2048×1080 resolution. With a 86% body to screen ratio the only thing you see when you look at the front of this phone is the display, which certainly takes center stage. In fact when holding the phone in your hand the display totally fills up the front of the phone and makes it feel like you’re just holding the display in your hand. This puts the S8 edge is the upper echelons of smartphones when it comes to design and attractiveness and is certainly the future of Smartphone design. With its 5.7 Inch display, the S8 is a fairly large phone and certainly worthy of the phablet title. its dimensions come in same size as orignal one Galaxy S8 so you won’t be able to reach all the buttons with just one hand, however that’s no problem as the custom samsung software, based on Android 7.1, lets you put shortcuts for all the buttons at the side of the display so it’s fairly easy to use with one handed. It not just about the screen, when we look at the performance this stunning mobile phone really shines thanks to it’s top of the line hardware featuring a Snapdragon 835 CPU, 6GB of RAM and not to forget the Adreno 530GPU. So as you would expect it’s a really fast when it comes to playing games and running apps. You should never be short of storage as this version has 64GB/128GB of memory and while a little is taken up with OS you’ll have plenty left for a plethora of games, apps and photos. Speaking of which we almost forgot to mention the camera which deserves to be highlighted as it’s a whopping 16MP sensor and can capture 4K video footage. The camera app is also really fun and immersive to use as you get the whole screen and with those virtually invisible edges it can be quite surreal as though you’re looking at the world through a window rather than using a camera. Packing a 4000mAh battery will ensure plenty of usage time and means you can go for longer between recharges which can be taken care of through the USB type C port on the base of the phone. The s8 edge smartphone comes with 18 months warranty, brought to you by the leader in electronic devices as well as wholesale Android phones..
Online Wholesale Samsung Galaxy Note 8 Clone,China 1:1 Copy Note 8 Clone,HDC note 8,Goophone Note 8 Free Shipping from Warehouse in EU,US,AU,UK free taxes worldwide! Wholesale Free Shipping Samsung Galaxy S7edge Mini Clone,China Clone S7 edge mini, has 5.0 inch HD Gorilla 4 Glass screen, with 1.6ghz processor, 2GB RAM, 16GB 32GB storage, and 16MP rear camera, installed Android 7.1 OS. With its Octa-Core CPU that has been clocked at 2.4GHz along with 6GB of RAM, an exceptionally fast and powerful performance will be delivered any time you turn on this Android device. Whether you like to enjoy demanding games, Full-HD movies, the latest mobile Apps, or simply like to browse the web – this premium phone is sure to meet all your demands. Additionally, it brings along great multitasking possibilities, allowing you to enjoy numerous of its high-end features at the same time without ever slowing down your Android 7.1 smartphone. With a stunning 256GB of internal storage and a second 256GB external storage option, you will have access to an unlimited pool or memory – guarantying that there always will be enough space for you to safe your latest files and media alike.